Our professionals can help you out with choosing the right gate design- just contact the office to organise a survey. Depending on your needs and preferences, the diligent experts can install a wide variety of gates, including sliding, dual swing, and pedestrian designs, as well as sturdy aluminum fences. For automated gates, Fantastic Handyman can send a crew of automatic gate installers and a qualified electrician to ensure that all work meets the BS 7671 standard, which is now obligatory for all newly installed gates. Unsure of the type of gate you want for your home? A trained surveyor can arrive on-site to painstakingly measure the dimensions of your pillars and the distance between them to propose a suitable gate design that will do your property justice. The gate fitters will check the ground level, as well as measure the size of your pillars and the gap in between to ensure that your gate will have enough free room to fit in. The team will position the bottom hinges with wedges, then drill holes at the appropriate height and fit them to your concrete or brick pillars with suitable screws. With the bottom hinges in place, the specialists will position the first door wing and ensure that the top and bottom gaps between the door and the pillars are both identical. After fitting the upper hinges and the second door wing, the handymen will mount the door handle and place a gate stopper to keep both doors firmly in place when closed. Regardless if you went for a pedestrian gate or a driveway gate installation, the industrious professionals will carry a suitable selection of tools to safely and sturdily mount it to your pillars. Said equipment could include anything from screws, wedges, hinges, and spirit levels to spanners, hammers, screwdrivers, electric drills, and chain breakers, depending on your project. The crew is well-acquainted with the wide variety of closing gate mechanisms on the market and will expertly use the gadgets at their disposal to install and calibrate them with utmost precision. Having a gate is no longer a luxury. 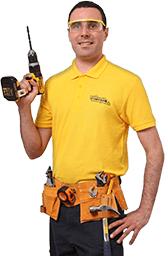 To hire experienced electric gate installers, all you need to do is fill in our online booking form, use our real-time chat, or give us a call. Our friendly advisers will then send the right operatives for the job based on the type of gate you bought. For your convenience, the team covers the entirety of M25 and can install your driveway or pedestrian gate at a day and hour of your preference. Keep in mind, however, that the gate installation cost will cover labour only, so the delivery of any additional materials will be charged extra.